I hope everyone had a wonderful Thanksgiving! I had a great time with my family and friends. Now I am in full swing Christmas mode! I finished my decorating yesterday so things feel pretty festive around my house. I love to entertain during the holidays so I will be sharing some of my favorite party dishes over the next couple of weeks. This particular dish is always a hit. A lot of people ask me what type of things I like to cook or what is my favorite dish to make. I have such a hard time with this question because I really like to make a wide variety of items. I cannot pinpoint a genre of food or flavors that I like most. One thing that I know for sure is that I love having dinner parties where the “meal” is a variety of appetizers. There are always lots of flavors and things to dip. I like to dip. Patatas Bravas is a great appetizer or side dish for lovers of dipping. They are one of the most popular dishes served in tapas restaurants. Patatas Bravas actually means “fierce potatoes” since they are usually served with a spicy dipping sauce. I wanted to make this dish for a recent tapas dinner party but I did not want to fry the potatoes, which is the standard method. I chose to roast them in a hot oven and it worked out really well! They were crispy on the outside and the inside was soft. 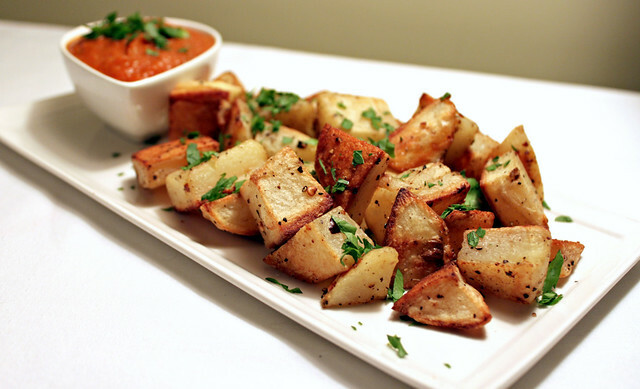 The Perfect Pairing for my version of roasted patatas bravas is a spicy dipping sauce. I have served these with a spicy tomato based sauce as well as a spicy roasted garlic aioli. Both of the sauces are a cinch to make so you could put out both dips and let your guests decide which one they prefer! Preheat your oven to 425 degrees F. Toss the potatoes with the olive oil, pepper flakes, salt, and pepper in a large bowl. Scatter the potatoes on a greased cookie sheet and bake in the oven until cooked through and crispy, about 35 minutes. Toss the potatoes halfway through the cooking process. Once they are cooked, taste for seasoning and add salt and pepper, if necessary. To prepare the tomato sauce, heat the olive oil in a large skillet over medium heat. Add the chopped onion and green pepper. Sauté until tender, stirring often. Add the pepper flakes and tomato sauce and bring to a simmer. Cook for 3-5 minutes. Pour the tomato sauce in a blender or a food processor, blend until smooth. Taste for seasoning and add salt, pepper, and/or red pepper flakes. To prepare the aioli, cut off the very top of the head of garlic. Place in two layers of foil and drizzle the top with olive oil. Wrap tightly in foil and bake in the oven until soft and golden, about 30 minutes. Allow to cool slightly and squeeze out the roasted garlic into a small bowl. Add the mayonnaise, mustard, and sriracha. Add cayenne pepper if you want it extra spicy. Taste for seasoning and add salt, if needed. Serve the roasted potatoes with the dipping sauce(s).